Cloud Computing Users increasingly attempt to negotiate contract terms for cloud computing services, in order to make them more suitable for their specific needs. However, despite the efforts they make, contracts are still often concluded on a take-it-or-leave-it basis, because of the negotiating power enjoyed by bigger cloud service providers against small service clients. 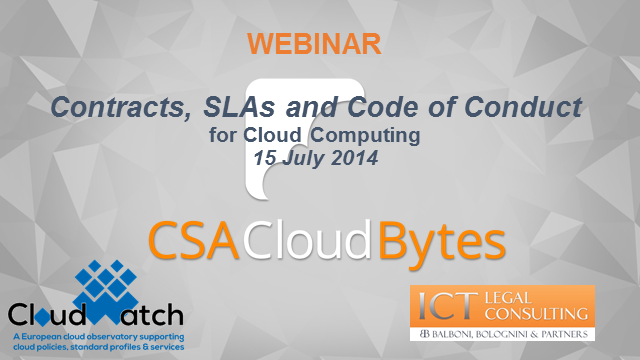 The webinar is a contribution to clarify what are the most common contractual issues between the parties of a cloud contract, such as, amongst the many, Jurisdiction, Service Level Agreeements and Privacy Level Agreements, and what is the level of advancement of the initiative undertaken by the European Commission under the European Union Cloud Strategy which will lead to the drafting of a Code of Conduct for Cloud Service Providers, to which Paolo Balboni is associated as a member of the drafting group.